Zimstocks, a mobile app that provides critical information on investing on the Zimbabwean stock exchange is now available for iOS devices.The app which is 6 to 8 months old was first introduced for Android devices and the iOS version was in development as far back as February 2014. Zimstocks founder and lead developer made the announcement via the Zimstocks blog two weeks ago, (Sorry we are late). 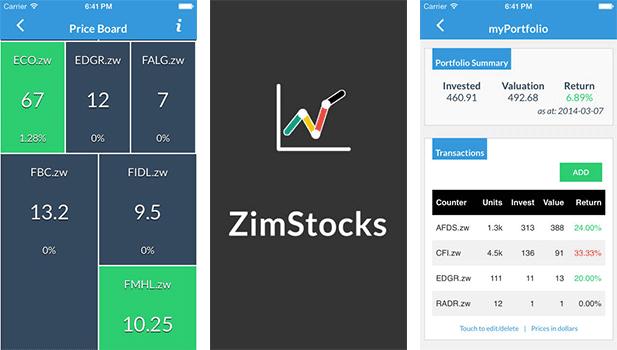 I am happy to announce that ZimStocks for iOS is now live on the app store. The app is FREE to use and is mainly targeted at iPhones and iPads. The long awaited release of the iOS app is in line with our vision which is “to help ordinary individuals build wealth on the Zimbabwe Stock Exchange through informative analysis and trading tools”. The look and feel of the iOS app is similar to the Android version and highlights key bits of information to show you performance of the Zimbabwe Stock Exchange plus a few other bits of useful information and analysis. Here are some screenshots. Beside the iOS version, the Zimstocks app has been consistent in their approach to gain credibility and brand presence. For instance, Zimstocks has more than doubled their Facebook fan count from 3000 in February 2014 to close to 7000 today. Utilising that sizable pool of followers, Zimstocks is also gradually building its thought leadership on local stocks by consistently analysing these on their blog. The app itself is continually evolving. Recently they added a feature called Sectors. Des says “this is basically an index for each sector where a user compares the daily performance of a sector. This will go a long way in helping users identify investment opportunities”. Des also tells me that ZimStocks will be adding a version 1 of a messaging or discussion offering in a release that is coming out in a few weeks. At this point, I am not sure whether this will allow users to send messages to each, a stock adviser or just to Zimstocks. We will have to wait it out on this one. Back in March, it seemed like Zimstocks had no clear business plan but rather, were waiting for data from users to tell them which model to follow. Des tells me that the business model is now clear but the “short term focus is on product and scale”. Whatever the outcome of that process is so far, Zimstocks has done exceptionally well do date and are already carving out an exciting startup story. sounds good but since this is Android country, they should have started with an Android app? ?